I haven’t always made the best choices, but one of the greatest lessons I have learned is that this is my life, my choice, and I take full responsibility for it. That wasn’t an easy pill to swallow at first. It was easier to blame everyone and everything else for the life I was living. But the truth is, only I could make my life different. That required taking my power back. That required letting go of the blame game and saying, “I need to make different choices.” I didn’t have bad luck. In fact, the problem wasn’t my luck at all. It was continuing to make the same choices, expecting different results. My life, my choice – your life, your choice. Today I want to give you the push to take your own power back and create and live a life that you love! We (you) deserve a great life. But we try to change our circumstances, our careers, our health, our happiness and our finances by looking to others to give us these things. Here is the truth – the whole truth and everything that I know to be true today based on the 39 short years I have been alive. The only person who can determine what kind of life you will live, and the quality of what that life will be is you. Creating the life of your dreams means giving up all excuses and all stories as to why you don’t have it. From this moment on, I don’t want you to have a limiting belief that you are a victim. You are so much stronger than you think – than you believe. You have all the power and the only way someone else can take it away, is if you give it away. Your past does not need to define your present and it most definitely doesn’t need to define your future. If something doesn’t turn out as planned and you want to get another result, start by asking yourself some very powerful questions. What was I thinking when I had that reaction? What I did I say or didn’t say? Could I have reacted or responded differently? Should I have asked for help? If yes, who could I ask next time? What are the benefits of trying it another way? Now for the most power question – what do I need to do differently to create the result that I want? This is always the question that I ask myself when I need a power boost. What can I do? What do I need to do? What do I want to do? If I want to be happy, what can I do to make myself happy? If I want to be healthy, what should I eat to be healthy? If I want to have a fit body, what actions should I take to achieve it? If I want to be loved, where do I need to give love? If I want a successful career, who do I need to become, or what does success look like to me? So much power lies within the actions that we ourselves take. So much power lies with your thoughts, your movements, your choices, and your attitude. So much power lies within YOU. Your life, is your choice. There is no judgment in the choices you have made or not made. You have done (and will do) the best you can with what you have and who you are in this moment. You are not always going to make the perfect choice and there will be days where you will probably make some not so great, you are only human choices. That is okay. That is life. We have to remember that we are human beings with so many emotions living a human experience. If you have to, make another choice. How you react, what you think, what actions you take based on your wants, desires, and needs, not everyone else’s, and definitely not based on past events that you are unable to change, are your choices. You also have the choice to no longer allow the things that live in the darkness to make your choices for you, like tiny mad ideas, limiting beliefs, past pains, or fears. You get to choose to travel your own path, take your own roads, or completely bust through the barriers and build your own damn roads. Life is all about choices and choices can change. 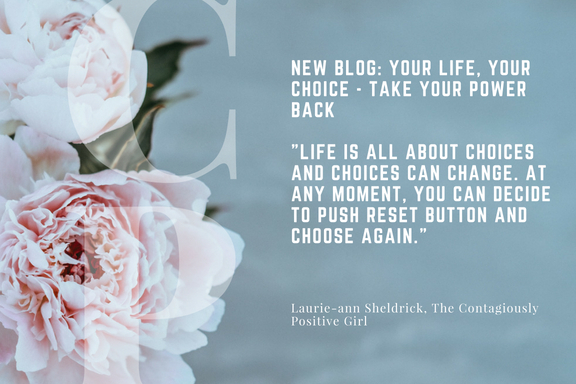 At any moment, you can decide to push reset button and choose again. What is the reset button you want to push? Do you want to enhance your relationships? Do you want to change careers? Do you want to discover your passion? Do you want to increase your feelings of joy, energy, vibrancy, love, health, self-esteem, body image, and self-love? What is it going to take? What do you need to do differently? Today you do have a choice. The choice has always been yours. You can enhance, change and course-correct absolutely every single area of your life. Some choices are harder than others and change isn’t always easy, but it is always your choice and the path to happiness is always worth the effort.